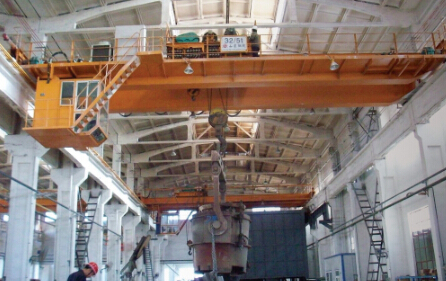 QDY overhead crane in accordance with GB/T14405-2011 standard and the request of Office of Quality Supervision Special【2007】375 document is applicable to convey molten metal and assemble modules in foundry. 1.The machine is composed of boxed bridge,travelling mechanism , trolley and electrical system，whose features are similar fo those of QD crane. 2. It adopts H-insulated motor especially for metallurgy crane. 3. The hoisting mechanism is equipped with two set of brakes (dual brake)which can work independently,as well as load-limiter and dual hosting-displacement limiter. 4. The pulley is made of cast steel and the rope is resistant to high temperature. 5. If necessary, special measures should be taken to protect the bridge from therma-radiated sources and eleetrical equipment from dust and high-temperature environments.